Is Metro360 present in my city? Currently, we are operational in Ernakulam. We are expanding fast to other cities. Like us on Facebook or follow us on Twitter to be updated on where we are moving next. 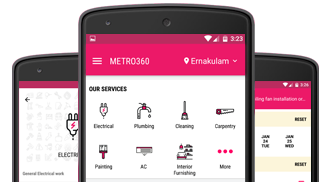 Who are Metro360 service partners? We aggregate the best service executives across our areas of operation, we have enough and more executives spread throughout the cities we operate in who can be made available to the customer at the time the job is requested for. Is Metro360 accountable for job quality? Yes, we are. Our service partners are 100% accountable for the job undertaken. However, if something goes wrong, we are committed to either re-do it or refund your money. We strongly recommend, YES. Our experience suggests that executive's on-site queries / clarifications are best handled if anyone from the household is around. What if the Metro360 service partner doesn't reach on time? In the event of a "no show", we can arrange for replacement, if possible immediately or at a later time convenient to you. We accept a job cancellation from your end. To avail this offer, please inform us the "no show" after one hour of booking time. What if job takes more than the estimated time quoted by Metro360? Normally, it doesn't happen as our service partners are experienced and they calculate the time required in advance by reviewing the requirement and clarifying the nature of work with you if required. What if I have to reschedule or cancel the service booked on Metro360? To reschedule or cancel the service, contact our customer care. Do the Metro360 service partners bring their own supplies / will I have to arrange for it? All Metro360 service partners bring in their own supplies. However, consumables such as bulb, ladder, and spare parts have to be made available by you or bought on actuals before work starts. Upon task completion, there is an option for the user to rate the agent and share the feedback. How do I pay Metro360? Pay the service professional directly as agreed for the job. Metro360 doesn't charge you.